Please use the following Stock Numbers to specify your choice of colors for workbench frames, top surfaces, T-Mold edges, and edge finishing. Our wide selection assures an aesthetic choice can be made. Main Stock Number + Frame Color Stock Number + Top Surface Color Stock Number. Remember: any up charges will be added to your order. Self Edged Tops Call for Pricing. 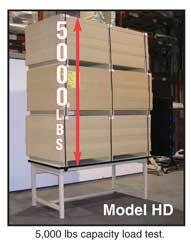 NOTE: Standard fixed height is 30" for all CHD Workstations. For different heights, change the height digits to show your choice, and add an up charge for the special height. For Example: to Order a 60L x 30W x 35 inch high CHD Workstation, with ESD top, Light Blue Frame, Dove Gray ESD work surface, the Stock Number would be: CHD603035C, F63L14, SG248, and the cost would be the total of all items and up charges. Note* SEFA-8 paint finish is smooth, standard paint finishes for cabinets are textured. Provide us with a paint chip. Provide us with an RAL number. Have a color in mind, maybe your corporate color? But do not have either a chip or RAL number? Send us what you have and will match it. Speak to our customer service department today to see how this program works.